Rivendell Mountain Works was founded in 1971....It died about 1980 in a bankruptcy, but its dream slumbered with two visionaries in the Seattle area of Washington State. In 2006, Rivendell has sprung back to life, and I've had the privilege of visiting its new location. Please click here to skip to information about the new Rivendell Mountains Works under Eric Hardee! In May, 2010 I received an update from Eric that was full of good news that the Rivendell Revival is strong and Jensen pack sales are steady, many of them to savvy buyers in Japan! The image below illustrates the basic design shape and strategy of the Jensen pack: two top tubes resting upon the load-bearing bottom tube, which then transfers weight softly to the hips. Rivendell gear had that beautiful, classic "Made in the USA" quality, built of the very best materials, made with extreme craftsmanship to last a lifetime of rugged mountain use. Above is their logo sewn in place on their signature backpack, a soft pack based on the historic Don Jensen soft pack design.... In the history of gear, the Rivendell soft packs rank as prime exemplars of the original heretical departure away from tried and true frame packs and into the realm of the Future: Soft packs and frameless packs of infinite variety. Rivendell's classy 1975 catalog stated that they had become, in 1971, "the originator of sophisticated soft pack design." Shown at left is their top-of-the-line model, the 4,800 cu. inch, expandible/contractible "Dr. Expando;" mine has travelled with me to Europe and back, and ascended innumerable Western mountains...One reader wrote that the Rivendell Jensen pack has become the "most copied pack of all time," and pointed out that one company (Wilderness Experience) even named their soft pack the "ROR," translating to "Rip-off-Rivendell." Rivendell Mountain Works was first located in Snoqualmie, Washington, but soon moved to a magical high mountain valley at the base of one of America's greatest ranges, the Misty Mountains, oops. just kidding, it was nestled at the base of Wyoming's Teton Range, in the tiny town of Victor, Idaho--- so not in Elrond's valley of the High Elves seen in "The Lord of the Rings"..... Rivendell Mountain Works existed during that happy earlier Age when Dreamers could hope to leave a major company and start an innovative company of their own, fueled by no corporate backing and no overseas production contracts. Larry Horton was such a dreamer. He left The North Face around 1970, and found a magic combination of friends and investors in the Seattle, Washington area..... For a brief time the infant Rivendell was based in Snoqualmie, WA, but soon Mr. Horton moved a thousand miles inland, setting up his own manufacturing/design facility in an old white church in Victor Idaho, near Driggs, Idaho. And, yes, the choice of the name "Rivendell" was not a superficial use of a name from literature; these were folks mightily inspired by the mythos of Middle Earth. For more on this piece of the Rivendell story, click here. The Start-Up of Rivendell, in the words of Larry Horton. Picture is circa 1970, and provided by Larry Horton. I visited Mr. Horton in 1978, and purchased this original Jensen-design custom soft pack (seen in the pack images on this page); I also purchased a pair of "Elf Boots," and a pair of "Hot Tamale" expedition mitts. Back home in Oregon, I languished over Rivendell's slim but iconoclastic catalog and dreamed of purchasing the company's uniquely designed ultra-strong tent, "The Bombshelter," whch was also a Don Jensen creation. Alas, I never found the money to send the check, and Rivendell vanished in 1980, having produced in their nine years of operation about 1,000 packs and 350 of the Bombshelter tents. Hopefully they sailed to the Undying Lands. GEAR ALERT: Rivendell/Jensen packs are still available on a custom basis (see page bottom). 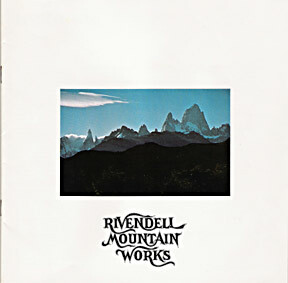 (image to the left is the front cover of Rivendell's 1976-77 catalog. The front and rear cover images were furnished by Dave Carman, a Tetons-area friend of Larry Horton's. Dave Carman later led a famous 1977 ascent of these Patagonian peaks with a 3-man group from the Tetons... Employee and Elf, Tim Shropshire did some of the inside photography for this catalog, while Adam Somers from Los Angeles was involved in product shoots in Chatsworth, California and in the final production..... Dave Carman's brother Peter Carman was also a noted climber, and Peter also designed and sold some gear of his own design, the famed Peter Carman Supergator (click here). The Carman brothers may have gone on to be very involved with the Jackson, Wyoming-based Life-Link Pole company, but I've unable to confirm that at this time (April 30, 2007). Second Note: Larry Horton is alive and well, and still living in the Mountain States, although he has changed careers.... I am in communication with him. Other Notes: regarding Jensen pack origins, a reader wrote that Yvonne Chouinard's "Ultima Thule" soft pack was probably the first widely available, commercial Jensen-design pack; however, circa 1971 Chouinard's catalog with the Japanese watercolor on the cover was offering for sale the Jensen pack itself for $48.00, but a later version of the catalog had dropped that and was now offering only the Ultima Thule...I also have a picture of a Jensen pack with two labels sewn on it, nearby to one another, both the "Rivendell" label, and a "Great Pacific Ironworks" label.....Famous climber/writer Doug Robinson states that he personally created a version of the early Jensen and took it to Larry Horton..Mr. Robinson also states that at a bit later date, he took a "refined" version to Chouinard that helped with the creation of the Ultima Thule.... 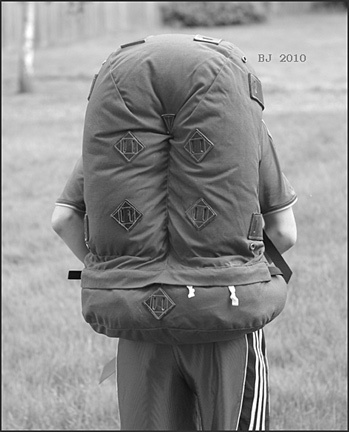 In any case, the Rivendell catalog states that Don Jensen created his namesake soft pack in the mid-1960s, and that Rivendell personally worked with Don Jensen under a royalty arrangement to faithfully produce true Jensen packs, right up to Don's untimely death in 1973 (Don had graduated from high school in Walnut Creek, California in 1961, gone to Harvard, later gotten a doctorate back in California, and was teaching mathematics in Aberdeen, Scotland when he met his end in a freak truck/bike accident while bicycling to work, Fall, 1973) . 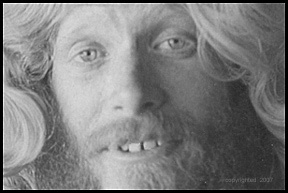 As an outdoorsman, Don Jensen was a climber and known for his Alaskan first ascents, in company of author/climber David Roberts. Click here for pictures and more information about Don Jensen. 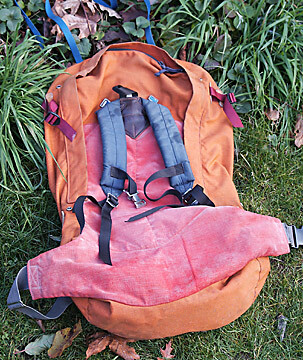 Pre-Rivendell Jensen Packs for $36---Don Wittenberger sheds this fascinating light on the earliest, pre-Rivendell history of the Jensen pack: "I have one of the very early Jensen Packs. They were made of coated pack cloth, were very light, but also very small and you could not get a sleeping bag into the bottom compartment. A small climbing store in Seattle (started by three Seattle climbers, including Bill Sumner of Sumner ice axe fame),* sold them for $36." We estimate that Don's Jensen pack was produced sometime in the late 60s. Shown below is my vintage 1978 Rivendell soft pack.. It was a modified Jensen designed by Larry Horton. (note: there was also a talented sewer named Larry Peterson, who hired on as one of the Elves in about 1975). Get an authentic Jensen Pack! Eric Hardee, near Seattle, WA has legal use (via Don Wittenberger) of the authentic Rivendell pack blueprints and has been sewing/selling custom Jensen/Rivendell packs via word of mouth advertising for many years. Eric can sew up an original Jensen or Giant Jensen for you--- Contact him! He is a true lover of this pack. His email is ewak3@juno.com. Tell him that you heard about him from OregonPhotos.com. 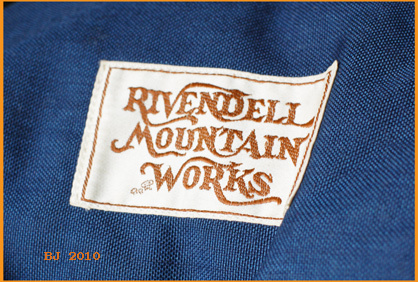 Eric has his own Rivendell Mountain Works website. More on Rivendell, see Pages Two, Three, Four and Five!